I’m not sure what made her want to compete in a triathlon, but compete she did! It was 29 degrees early in the morning [but warmed up in the afternoon!] I guess that’s why it was called the Ice Breaker! After the bike race her hands were completely numb, her lips here blue and her teeth were chattering, her hair was nearly frozen [this after the swim and then going out into pretty dang cold weather!] I said, “Wow, you’ve done enough. You can stop if you want to. You are already amazing.” But she wanted to change into a warmer [spelled d.r.y.] shirt and off she ran to finish her mile. You may be thinking this doesn’t actually look like a race. 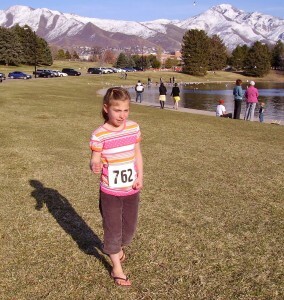 You may be thinking she wouldn’t actually be running a race in flip flops.You may be thinking her grandma forgot to break out the camera. You may be thinking she made her pin the number back on later in the day when we were at Sugar House Park and pretend she was running. Yah, you’d be right.